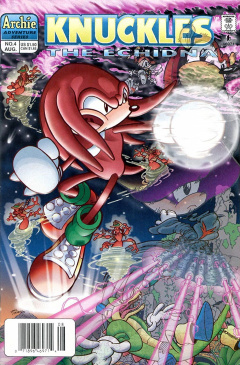 Knuckles the Echidna 4 is the fourth issue of the Knuckles the Echidna comic. This comic features one story: "The Phantom City", the first part of the Lost Paradise arc. In a swamp land on the Floating Island, Vector the Crocodile swims in the sea singing to himself. He opens his eyes while in the middle of singing, noticing a shadow on the surface. He surfaces slightly to snoop in on the source of the shadow, discovering an intruder on the shore. Taking action, he jumps out of his cover in the water and confronts the intruder: a member of the Dark Legion. He prepares to punch the intruder, but the caped Dark Legion member is quicker, getting his own punch in easily. Grabbing Vector, he throws him aside and walks away, revealing a taser and his intent to fry a fellow echidna. Not far from the swamp, Knuckles meditates in a clearing to pursue knowledge and enlightenment. In the middle of the meditation, Archimedes appears, noting that he finds Knuckles isn't taking his meditation seriously. On that note, Knuckles agrees, thinking it is a bunch of mumbo-jumbo. As Archimedes tries to explain the reasoning behind meditation, he is quick to notice the Dark Legion member with the taser, quietly approaching behind Knuckles. As the Dark Legion member approaches, Archimedes whispers to Knuckles about his arrival. Using this to his advantage, he signals Knuckles to attack, just as the member gets behind Knuckles. ...revealing a pink female echidna. Knuckles is shocked at what he has seen, giving the pink echidna a chance to knock Knuckles aside and get the taser. She mocks him for falling for a girl, as Archimedes steps in to help, breathing fire at her hand, causing her to lose the taser again. While she tends to her burnt hand, Knuckles thanks Archimedes as he takes the taser, removing the batteries from it. After doing so, he turns his attention to the echidna, asking her why she did such a sneaky attack, and where Kragok and the others have gone since their base was destroyed. She reveals herself as Julie-Su, and mentions that she has no idea where Kragok has gone. Although he's pessimistic about that, she explains that Kragok had activated the base's self-destruct because of his paranoia. She, on the other hand, had seen Knuckles run past her while the base was preparing to self-destruct. She tried to follow him, but had to give up on that in order to escape in time. She then reveals that she wanted to rejoin the others, but something had held her back, the thought of finding Knuckles. While Knuckles and Archimedes contemplate her story, the Chaotix arrive on the scene to talk to Knuckles. Vector is quick to notice Julie-Su, so he runs in and tries to attack her for what she did earlier, but Knuckles stops him, which Espio also agrees with. With Knuckles still holding back Julie-su and Vector, Espio explains that, while finding Vector after his confrontation with Julie-Su, a strange disturbance occurred in the Marble Zone, massive shaking of the ground. Knuckles is curious, however, why he didn't feel any shaking, while a camera pokes out from a nearby bush. Locke, Knuckles' father, listens into the Chaotix, Knuckles and Julie-Su discussing the circumstances revolving around the Marble Zone. She believes it could've been her former comrades' work, which makes Vector retort why she says 'former' when she continues to wear a Dark Legion cloak, so she takes it off, but he's still not convinced. The issue regarding Julie-Su confounds Locke, who had not anticipated something like a Dark Legion member switching sides. Athair enters the room, while Knuckles discusses their plan. He and Archimedes will go check things out, while the rest of the Chaotix will stay behind. This quickly angers Julie-Su, who wishes to come along, thinking that boys always think that they know what's best for everyone. He gives in, letting her join them. Athair, watching over everything, also notes that he doesn't like what is going on, but Locke just states that they'll have to be ready for anything that comes up. After many hours of searching the Marble Zone on the Floating Island, Knuckles, Archimedes and Julie-Su can't locate any clues as to what trashed the area. When Julie-Su goes to mention that she can't find any sign of her people, which Knuckles interrupts and finishes the sentence, she gets angry, starting an argument between the two. Suddenly, a small explosion knocks all three of them aside. As they recover, Knuckles looks up, seeing a large city on the horizon. Athair and Locke continue to watch, and are concerned, but with Archimedes at Knuckles' side, they believe the three of them will be fine. The city disappears for a split second, and reappears, making Knuckles wonder if it is a Dark Legion trick. She retorts, asking him why she just doesn't blame him for everything, but Archimedes stops the two, telling them to bicker later and to find out what is going on. The group walk toward the city, instantly entering a liquid portal-like entrance. After entering the portal, the group find themselves right in the middle of a reformed Echidnapolis, thriving with many echidnas and towering skyscrapers. The two echidnas are shocked and astounded at the sight of the city, which they believed to have fallen, but Archimedes confirms that it does, indeed, look like the old city of Echidnapolis. Julie-Su looks around at the wandering echidnas, noticing that nobody is paying attention to them. While Julie-Su believes this, Knuckles is recognized by a female echidna who runs over. Knuckles doesn't recognize her at first, but as she gets closer, he realizes that it is his mother. She asks him for a hug, but Knuckles only notes that he thought she was dead. She turns away in shock, asking him if his father told him that, but Knuckles corrects her, stating that he only told him that she was gone. He then notes that his father was the only echidna he had known about until recently, and that he never questioned what his father told him. Before he can continue on, a bright light appears behind his mother, as the entire city disappears. The group find themselves back in the Marble Zone ruins. Julie-Su has no idea what has happened, but Knuckles believes he knows who does. He turns around to Archimedes, taking a gamble that he knows about his parents, why he hasn't seen any other echidnas until recently, and why he is kept in the dark about it all. Archimedes pleads with Knuckles to not ask those questions as he isn't ready to know yet. Knuckles doesn't stop, wondering who said so, him or his father. Before anybody can say anything more, the ground trembles, creating a chasm that Knuckles gets caught in. Before he can fall, Archimedes grabs onto him, while Julie-Su, still on the surface, grabs Knuckles leg, saving him. While the two share sarcastic remarks, Knuckles helps himself up. Archimedes then goes over to Julie-Su, where she asks him if he is always so rude. He explains that he has actually gotten better than before, but is interrupted as the ground shakes again. The large city of Echidnapolis appears again. Wanting some answers, they decide to reenter the city. Upon entering the city, they notice the atmosphere has changed; everybody is in a panic. Knuckles stops a citizen, who warns him that it is judgment day, the end of the world. He runs off, wanting to return to his family. With not much help from the citizen, Knuckles decides that they should go visit his mother. They run off, hoping to be able to find her, but Julie-Su finds something that could help: a statue. They look at the engraving, which mentions that the statue was made in gratitude for their guardian Hawking, and his creation of the Hyper Zone Projector. Knuckles realizes that this projector must be the reason for the panic, and that he must find out what has happened to Hawking and the projector itself. Before they can begin their journey, Julie-Su and Knuckles hear an individual. They turn around, to find them surrounded by echidna security guards, while their leader demands some answers of his own from them. Julie-Su's first appearance. She would later become a major part of the series, eventually joining the Chaotix and becoming a love interest to Knuckles. Julie-Su, Hawking and Lara-Le are introduced. Remington and the Echidna Security Team are shown for the first time, but not introduced by name. Upon Knuckles' arrival in Echidnapolis, an X-Wing from Star Wars is visible, flying in the sky. Although the Marble Zone is mentioned and shown, it is not the same Marble Zone as shown in Sonic 1.